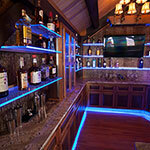 LED Strip Light Channels provide a modern and clean linear lighting solution for any type of application. 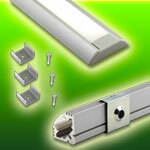 Easily create custom low voltage lighting fixtures using our aluminum extrusions and covers with our LED strip lights. The modern, long lasting, bright, and eco friendly linear lighting fixtures are perfect for any home, business, indoor and outdoor lighting applications. 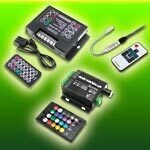 Choose from our variety of single color and color changing strip light options to mount inside a large array of aluminum channels with both clear and frosted covers choices. 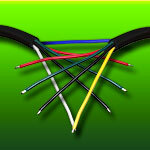 Strip your wire leads no more than 1/8" and tin them with flux core electrical solder. Before soldering to strip remember to put your wire through the end cap with hole. Always use 18-22AWG stranded wire. larger loads require a thicker guage. Tin the copper pads on the LED strip light with flux core solder. Solder the wire to the copper pads. Be sure no solder points or fray wires are touching. Always test your connection before installation. Use heat shrink to cover any exposed copper pads on the bottom of the strip light at your soldered connection. Exposed copper with no 3M mounting tape or heat shrink will cause an electrical short on the aluminum channel. End caps are an optional accessory and give your channel a finished look while blocking light leakage. If you are using end caps install the closed end to get an idea of how much space it will take inside the channel. Most end caps require a small amount of space for installation. If necessary, layout your strip light next to your channel and determine where to cut your strip. Always cut your strip light on the cut line between the copper pads. Cutting elsewhere will damage that section of the strip. Peel back the 3M double sided tape and adhere your strip light to the aluminum channel. For best lighting results center your strip light between end caps or channel ends. Install holed end cap (optional). End caps require a small amount of space, measure this space and cut your cover accordingly. To avoid making two cuts you can mount the cover and mark the left over for cut off. Use a fine toothed hacksaw or band saw to cut the cover to mount with end caps. Be sure to make a straight and square cut to avoid any gaps for light to escape. The plastic covers are specially designed to press into place, never try to slide the cover into place. Starting firmly against the end cap slowly press the cover into place. 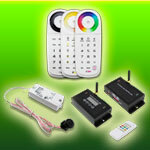 Now that your channel is complete you can wire it to your low voltage power or control source. Install the channel in place using mounting clips or double sided VHB mounting tape.